Security is the collective responsibility of all players in a healthcare delivery organization (HDO), from vendors and third parties to threat intelligence-sharing platforms. What makes healthcare, and particularly hospitals, a popular target? According to the Ponemon Institute, this is the seventh year of healthcare data breaches costing the most, estimated at more than 2.5 times the cost of similar attacks in other industries. To best defend against increasingly sophisticated cyber threats, we assess the threat landscape of an HDO, typical threats and better practices in preparing for a breach. Assuming the reality of an HDO includes overlapping systems, lingering legacy systems and connected medical devices, it is easy to conclude HDOs and medical device vendors are faced with securing a complicated array of endpoints. 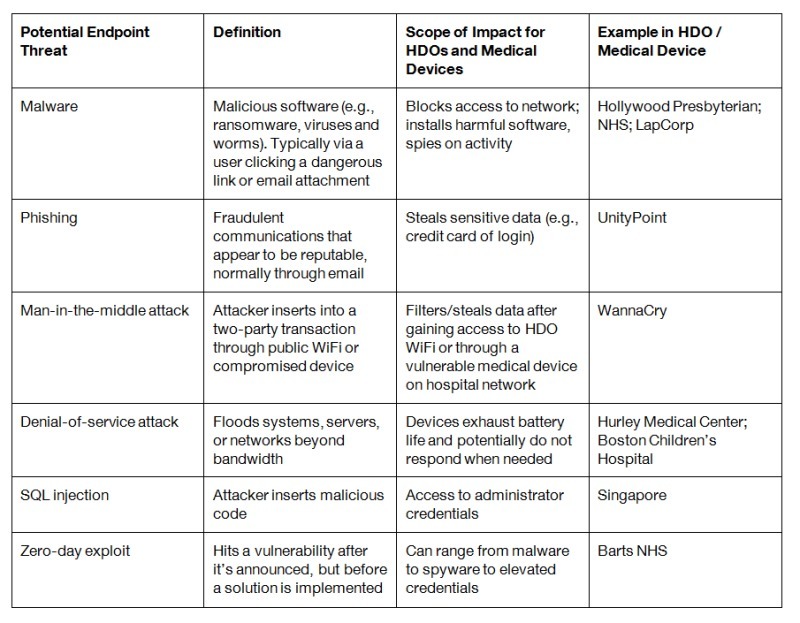 With an increasing number of devices connecting to HDO networks, each endpoint presents a possible entry point from which a malicious actor could launch an attack. Criminals are sophisticated, but also rely on probability odds. The more endpoints targeted, the higher the likelihood of finding an entry point. A recent review of all medical device disclosures identified a 400 percent increase quarter over quarter, with a prediction that the trend will increase. Whenever an endpoint connects or a user runs software that is unpatched or out of date, the threat surface expands.